Lovingly designed gift box with 20 blossom-shaped Alpine milk chocolate confections with milk cream filling. 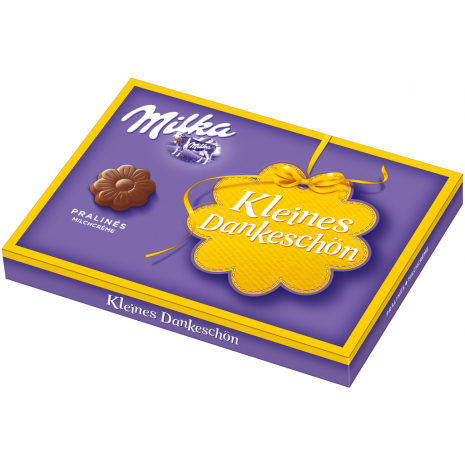 Milka „Small Thank You“ is a special series of blossom-shaped chocolate confections. Each chocolate blossom is made of the finest Alpine milk chocolate, filled with a delicious milk cream. The perfect way to say „Thank You“ to family, friends, loved ones or coworkers. Each lovingly designed gift box contains 20 delicious chocolate confections. 110g / 3.88 oz NET. WT. Sugar, palm oil, cocoa butter, SKIMMED MILK POWDER, SWEET WHEY POWDER (from MILK), cocoa mass, BUTTERFAT, emulsifiers (SOY LECITHINS, polyglycerol polyricinoleate, sunflower lecithins), HAZELNUTS, flavors, WHEY PRODUCTS (from MILK). Zucker, Palmöl, Kakaobutter, MAGERMILCHPULVER, SÜSSMOLKENPULVER (aus MILCH), Kakaomasse, BUTTERREINFETT, Emulgatoren (SOJALECITHIN, E476, Sonnenblumenlecithin), HASELNÜSSE, Aromen, MOLKENERZEUGNIS (aus MILCH).